Adith has the rare Moyamoya syndrome that was not diagnosed in time. Since then, he suffered 3 strokes, and had a malignant tumour in the brain. 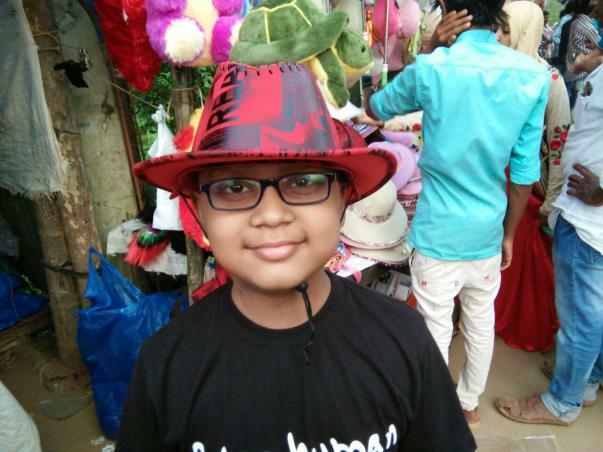 The doctors had given up, but miraculously Adith got better. His father has already spent about 40 lakhs on Adith's treatment and now needs support till Adith is out of danger. 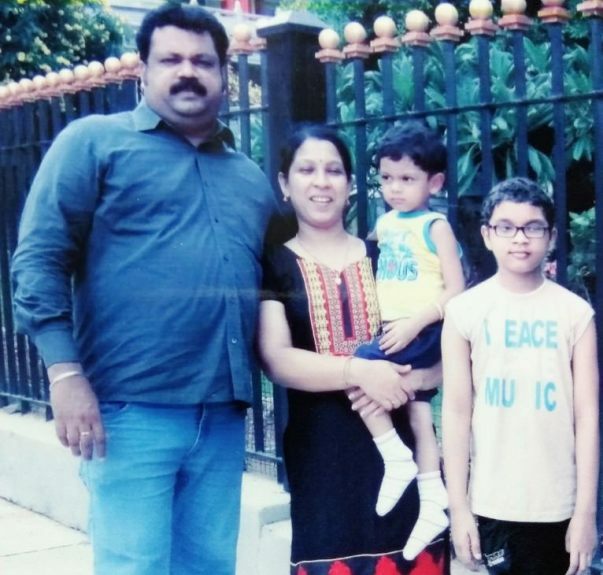 In the last two years, Adith's parents Nandakishore and Jishitha have relived a parent's worst nightmare over and over. They could never have imagined what their son would go through when they first took him to the hospital when he couldn't lift his right hand or stand properly. Residents of Calicut, Adith was at first taken to Calicut Medical College. The doctors diagnosed him with Rheumatic Choria and started medications. When Adith got much worse despite the heavy drugs, the doctors did more tests and diagnosed him with another deficiency illness. Adith got more and more sick and even had a stroke, the doctors couldn't tell what was wrong. Nandakishore's friend suggested he visit NIMHANS, Bangalore and that was the first breakthrough in Adith's treatment. At NIMHANS, the doctors told Adith's parents that he had the rare Moyamoya Disease – with an incidence smaller than 1 in 1,000,000 people. The arteries in at the base of the brain get blocked in this disease. Left untreated, the patient suffers from haemorrhage and even stroke in the brain. To get better, Adith needs a simple surgery and maintenance medicine. 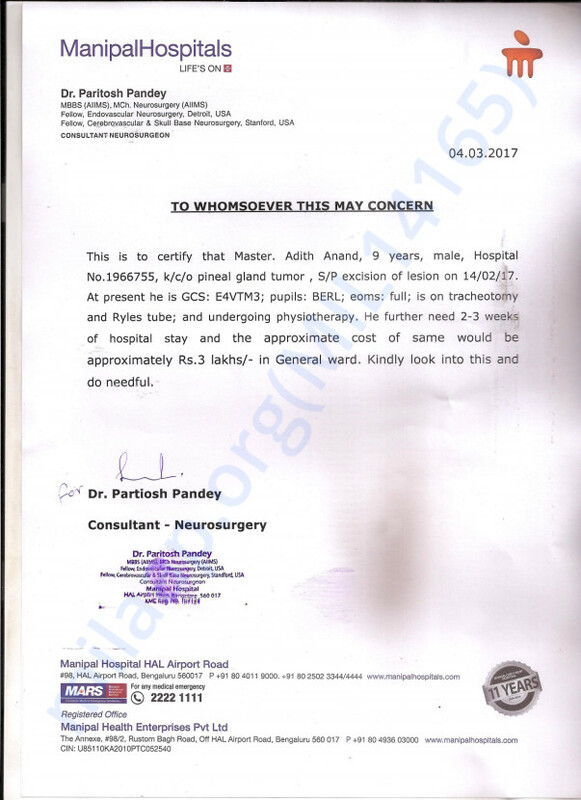 This was when a tumour was found in Adith's pineal gland in the brain. 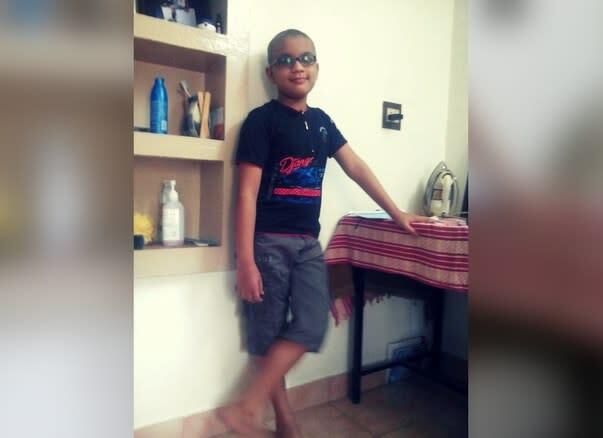 The tumour was growing and needed chemotherapy and radiation before it could be surgically removed and Adith could get the treatment he desperately needed. On the last day of chemotherapy, Adith suffered a stroke. The radiation had to be delayed by a month. After radiation, the tumour was finally removed. Unfortunately, Adith had another stroke. Years of non-stop treatment had taken a toll on the child's body. He was admitted to the paediatric intensive care unit (PICU) and the doctors told the parents to prepare for the worst. 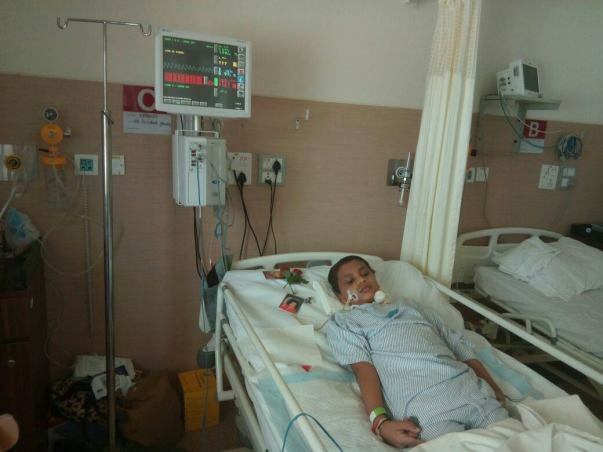 Not one to give up, Nandakishore continued to keep him in intensive care, and miraculously, Adith got better. His vital signs improved and he has been shifted to the ward and has regained consciousness. Every day, he is continuing to get better. His parents have seen hope and are determined that nothing come in the way of Adith's treatment now. More than losing two jobs in this time, what Nandakishore regrets more is how he has had to neglect his younger child. “He is only 3-years-old and he doesn't understand that his older brother is sick. He stays with his grandmother. Normal parents would give their 3-year-old more attention than the older child, but there is nothing normal about our situation,” says Nandakishore. Because his son needed him, he has had to quit his job as an insurance agent. The family has sold off all their gold and spent all their savings on Adith's treatment. 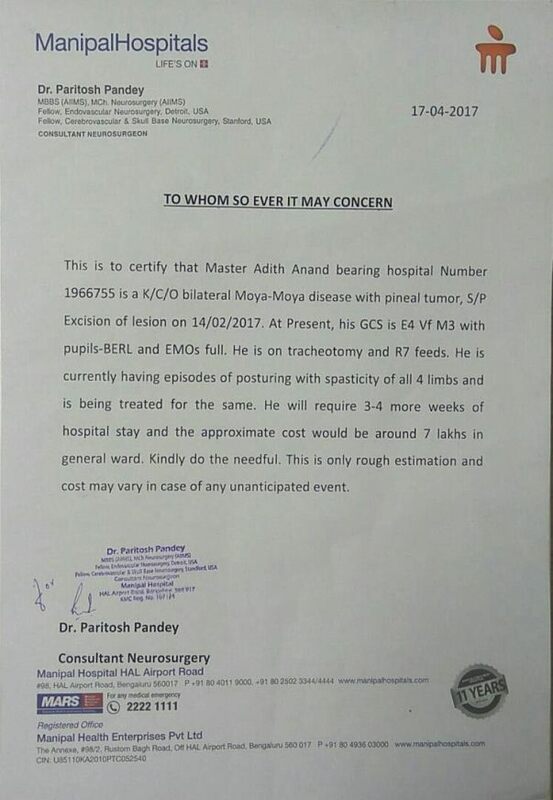 Nandakishore has taken a loan of Rs 28 lakhs for Adith's treatment. Adith's stay in PICU finished the money saved for the last round of treatment and the family urgently needs help for Adith's treatment till he gets better. The last few years have been very tough on this previously happy family. Adith needs to get better to undergo another surgery. The family needs support till that can happen and Adith is discharged. Contribute now and help Adith in his fight for life. Doctors were able to successfully remove the tumor of my child. But Adith is still not at his best. He is currently unable to eat. So, he is surviving only on fluids, mainly juices which are high in protein. We had to rush him to the hospital twice, post his surgery, due to abnormal movements. Currently, he is unable to remember things and recognize people. He is able to recognize us, the family. We have been able to arrange for some regular ayurvedic massages to help him with his arm movement and memory. We hope our child gets better with time and our continuous efforts. Please keep supporting us so we can live happily together. Here is an update on Adith's health. He underwent chemotherapy and has a chemo port installed to his chest through which the medicines are being given. The chemo has stopped now but the port will be taken out only after 2 years. As he was recovering from the chemotherapy, he developed a Urinary Tract Infection because of which his immunity has come down. It usually takes 3-4 days for the infection to get cured but it has been 9 days for Adith. The antibiotics are not working 100% because of the low immunity. The doctors are continuously giving water and trying to make the infection go through the urine. Adith cannot be discharged till the infection has been fully cured. Because of the continuous treatments, the hospital bill amount has increased to 7 lakhs. The improvements in his health has slowed down because of this infection. The target has been increased for Adith's campaign. Thank you so much for the love and support. Please pray for his speedy recovery and continue to share it with your friends and family.